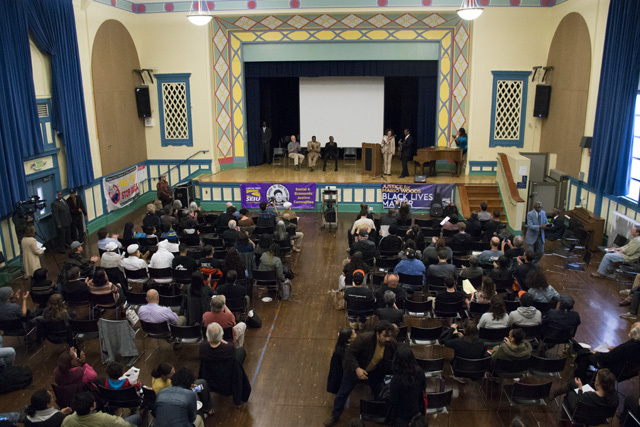 Some 150 people gathered at Buena Vista/Horace Mann Community School Thursday evening to build momentum in a joint movement involving several activists groups who are challenging police practices and narratives in at least three other officer-involved shootings. Earlier that day, police had shot and killed a Mission District homeless man armed with a kitchen knife. 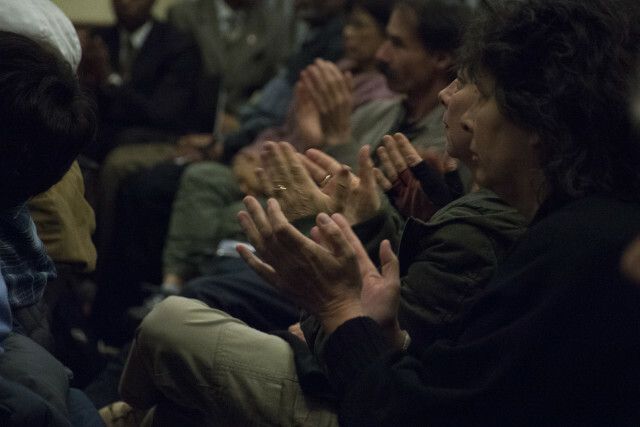 The April 7 town hall meeting had been scheduled weeks before, but the shooting still featured strongly in the evening’s statements. Officers said the man had been threatening them with a knife, an account that witness testimony disputed. Smith compared the shooting of the homeless man, identified by residents of the encampment where he lived as “Jose” or “Luis,” to the 2015 officer-involved shooting of Amilcar Perez Lopez in which an autopsy report contradicted initial police accounts claiming that the man, armed with a knife, had lunged at the officers. Eyewitness reports said that the man had never brandished his knife and, according to one witness, lay face-down on the ground during the confrontation with the officers. “The police narrative is the same, the difference is that the knife keeps getting bigger,” said one member of the audience as video footage that captured the December 2, 2015 shooting of Mario Woods was projected in the school’s auditorium. 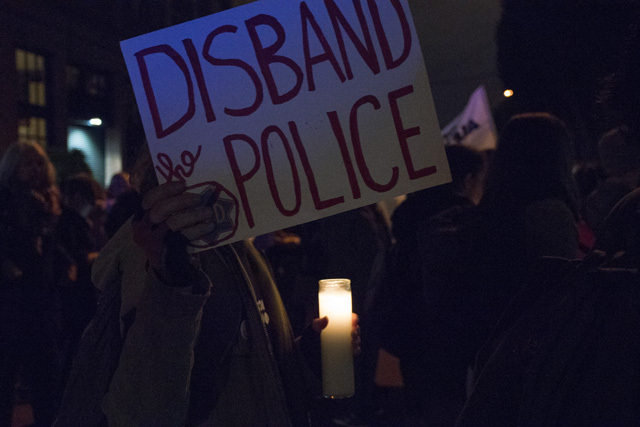 Advocates have also accused the police department of acting with impunity – none of the officers involved in these most recent shootings have faced criminal charges. Christopher Muhammad, minister of the Nation of Islam, said a “marriage” between the three coalitions is necessary in seeking reform of police practices. Police officials were posted in front of the school throughout the two-hour meeting, and two officers who briefly entered the auditorium where met with adversity from some members of the crowd. “You don’t belong here,” someone told them. 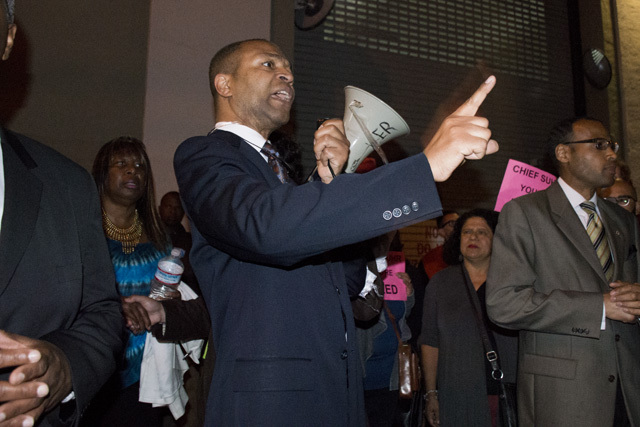 After the meeting concluded, Muhammad led a crowd of more than 100 people down Mission Street to 19th Street and then to the scene of the earlier shooting. 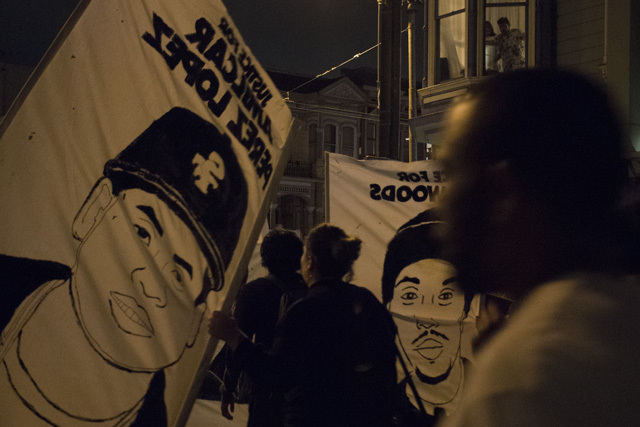 Holding banners calling for justice and chanting forcefully, the group prompted conversations among bystanders and bar-goers on Mission Street. Anne Peterson, an immigration attorney, had been discussing the homeless man’s shooting with a friend as protesters passed by. Adrianne Brown, a Mission resident, said that she sympathized with the marchers and was shocked when she heard about Thursday’s shooting. A small memorial marked the spot where the man had been shot. 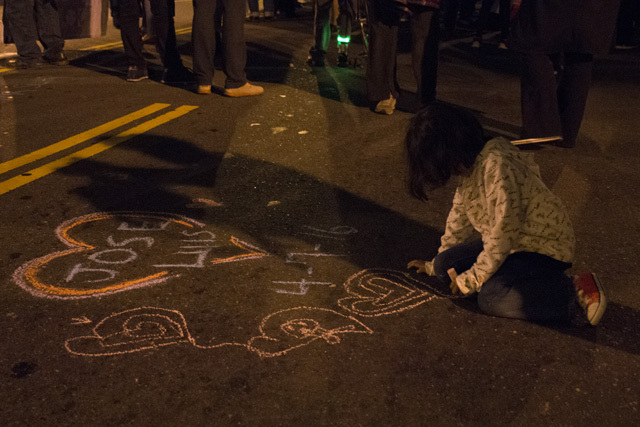 During the march’s pause at the site, someone covered the spot where he died in red paint. 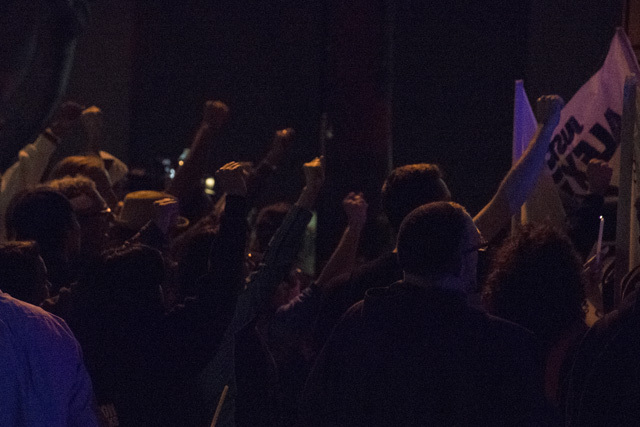 After a brief moment of confusion over whether the march would continue or end, the protesters moved on to make their way toward Mission Police Station. 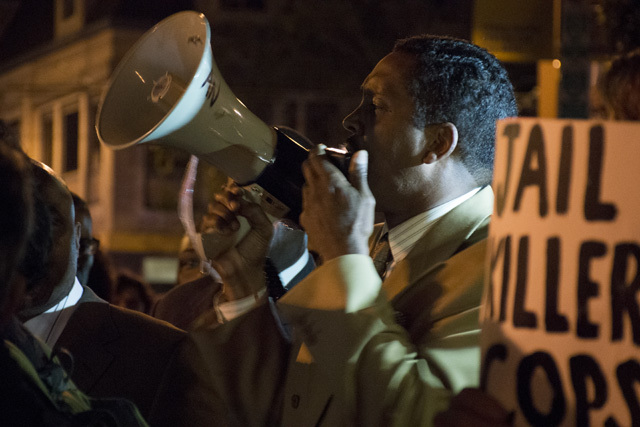 Upon their arrival at the station, protesters again took to the megaphone. 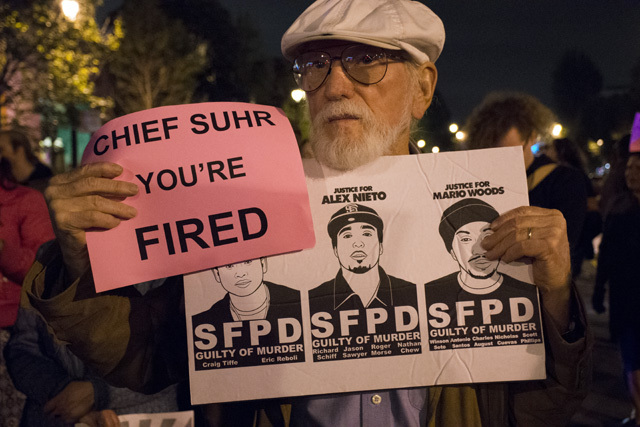 Muhammad called on officers within the SFPD to oppose police violence from the inside, and said many officers owed their jobs to community efforts to diversify the police force. One officer, Lieutenant Con Johnson, joined a small group of marchers in a lengthy discussion after many had already made their way home, saying he wanted to have a dialogue. The group included rapper Equipto, candidate Lindo, and a local member of the Franciscan Society, Brother Damien Joseph. Brother Damien, whose legal name is Brent Richards, is a former corrections officer. He works with the homeless often and told Johnson he would not call the police if he encountered an upset homeless person with a knife. “You got divine intervention,” Johnson joked. Johnson made an attempt to diplomatically explain how officers perceive an encounter with a suspect after having been called to the scene of a stabbing or a person with a weapon. “Right, a non-deadly crime,” Lindo responded. Despite a few argumentative moments, the exchange remained peaceful. “What I’m saying is that we all have to have dialogue we all have to respect the others’ view,” Johnson said. Many times, I felt threatened by aggressive homeless men who are not just simply sleeping in front of my office door, but also trashing the front of my office, throwing up, shooting up, leaving needle and bloody rags behind. I have had day-time, mid-day, evening-time robbery attempts and threats. I have witnessed addicts, pimps, working girls fighting in front of my office even during day light. I have had homeless intruder into my home. I have had people vandalizing and breaking my windows during evening hours yet no witnesses on the street had come forward with a video or a photo nor had anyone reported to the police. But, never have I ever witnessed police abuse of any of these homeless guys or girls. Yes, I wish the perpetrator could have been arrested, and properly prosecuted. I wish I have felt safer. The fact of the matter is, SF police are more like social-workers when it comes to handling homelessness. So before you raise a hand against the police, really ,truly attempt to know the full story. Yeah because the police weren’t the ones who shot him dead? Yeah no reason to raise a hand against police. And how is he a perpetrator? Whats his crime, being poor? Get over yourself. Recognize your priveledge. If you feel threatened by homeless people, you should ask, no INSIST that your elected officials; municipal, state, and Federal, build housing for all citizens, and to properly fund public health services. The police cannot solve these problems. The problem of Killer Kop Kulture exists whether there are homeless people or not. Many if not most cops are misogynists, so I’m not sure you’re any safer around cops. Indeed, every person I know who has had a relationship wth a police officer has been abused; in one case, raped. I’m sure there are some officers who are motivated to protect and serve. Unfortunately, it’s about the same ratio as politicians.